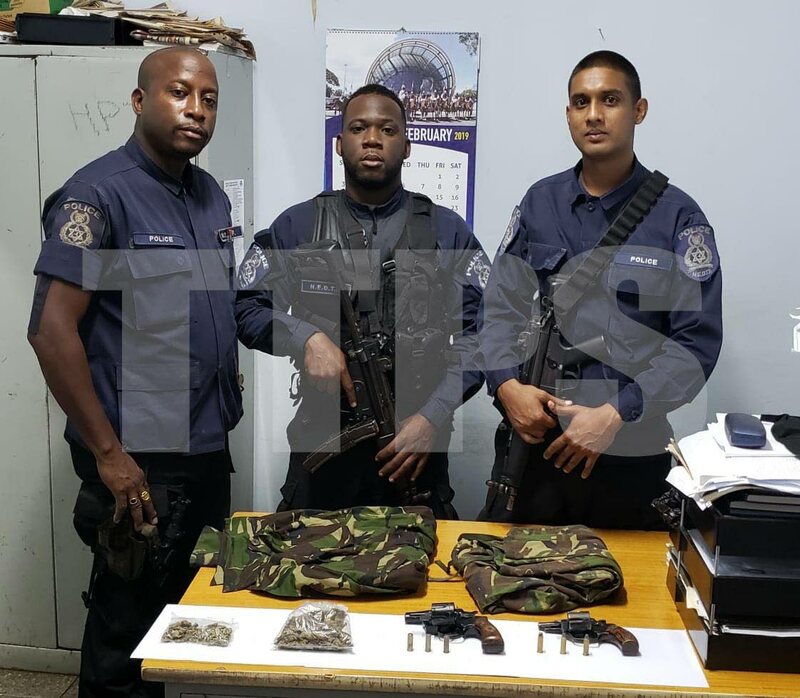 Thirty-one people were arrested by police in two separate anti-crime operations between Thursday and Friday and a quantity of guns, drugs and ammunition seized. In the most recent of the two exercises, officers of the North Eastern Division held three men for possession of marijuana. The officers also seized two guns, a quantity of ammunition and camouflage clothing. The exercise, led by Snr Supt Inraj Balram, ASP Ramesar, Insp Baird and supervised by Cpl Lavia, was conducted between 1 pm and 11 pm, on Friday in San Juan by officers of the North Eastern Division Task Force. Acting on a tip off, the officers went to Kanhai Street, Aranguez where they stopped and search a vehicle with two men. During the search they found 77 grammes of marijuana. The officers then went to the El Socorro home of a man known to them to be involved in criminal activity. At the home, they found 15 grammes of marijuana and arrested the suspect. The team of officers then went to Newalloville Road Extension, San Juan where they searched an abandoned building. Inside they found two revolvers with six rounds of .38 ammunition, one camouflage jacket and camouflage pants. In the second exercise, 28 people were held during Operation Strike Back in the Eastern Division. This exercise began on Thursday and ended Friday and involved officers of the Eastern Division Task Force and the Criminal Investigations Department. The officers searched known drug blocks and homes while several vehicles were stopped and searched. Of the 28 people held, one man was held for sacrilege and another for breach of a protection order arising from a domestic violence dispute, robbery with violence and malicious damage. Three men were also arrested for malicious wounding, resisting arrest and obscene language respectively. Two men were detained for possession of marijuana. The remaining 21 were held on outstanding warrants and 20 drivers were ticketed. Reply to "Police arrest 31, guns, ammo seized"